The modern art museum Centre Pompidou-Metz has an exhibition you might wish to see: “!917” is a collection of works on the theme of creativity during wartime. “The catalogue for 1917 is the sixth to be published by the Centre Pompidou-Metz. “Whereas the exhibition addresses its subject thematically, the 600 pages and 1,070 illustrations of the catalogue adopt a complementary approach in three parts, namely a series of essays, a dictionary, and a journal for the year. “In part one, three essays by historians and art historians shed a general light on the year 1917. The second part takes the form of a dictionary of 1917, comprising 225 concise bibliographic and thematic entries on the people, events, places, disciplines, culture, art and ordinary life that ‘made’ the year. This part is illustrated by many of the works and documents in the exhibition. “Part three, a journal for the year, uses the then popular almanac form, with two brief introductions on image literacy. “Each day is represented by a calendar and a timeline of military, diplomatic, political and cultural events, and is illustrated by documents available to the public in 1917, such as posters and magazines. Among the pieces in the exhibit is the front curtain Picasso painted for the ballet “Parade,” performed by the Ballet Russes in Paris in 1917. Picasso also designed the Cubist costumes, including a horse that had a mannequin rider, which fell off during dress rehearsal. Everyone laughed; that was the last of the horse. The story was by Jean Cocteau, music by Eric Satie and choreography by Leonid Massine. The audience didn’t like it. 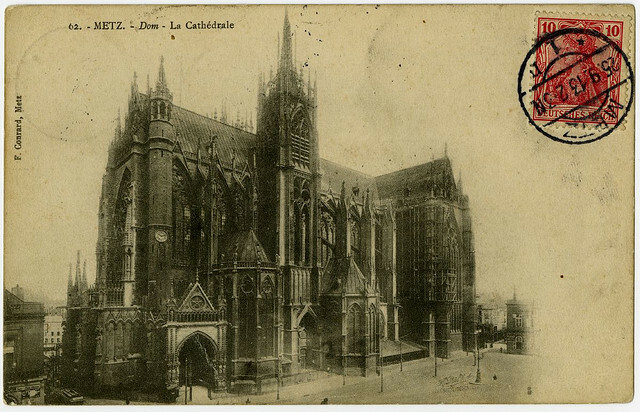 Metz is a city in Lorraine that was lost to the Germans in the Franco-Prussian War. Eagerness to retrieve it gave France strong motivation to enter World War I. This entry was posted in People and tagged Alsace-Lorraine, art, Picasso by World War One Historical Assn. Bookmark the permalink.